Mariah of The Joyful Jewel in Pittsboro, North Carolina, asked me to give her some background on the motifs I use in my silk paintings. I thought I’d share that information with my blog readers. Although the description of the original Sumerian cylinder seal says the priestesses are bringing a worshipper to god, I think of them as women supporting each other in community. The eagle (not shown in this view) is a protective spirit and has played the historic role of carrying one’s prayers to the sky. The oak leaf is a symbol of strength and longevity. I have always had a love for the first historic cultures. Even though I’m 30 years past youthful idealism, I still have no interest in history when it’s taught as battle dates and cultural dominance. I think that the real story is found in the way a culture uses the natural world to establish itself, develops ways of communication, and creates a vision of its place in the world. I envy the peoples for whom beauty is part of everyday life and imagine a time when people were profoundly sure that they were of the earth, not simply on it. The stories that survive generations are those of people doing the right thing simply because it is the right thing to do, what the gods expect, and what upholds a family’s honor. This piece is hand painted using the serti, or fence, method of using resist to draw the design. 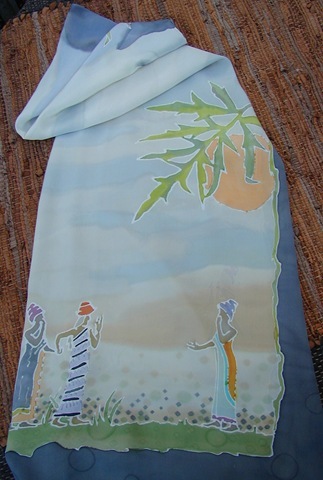 The silk is stretched like canvas and painted with a paintbrush using professional silk dyes. This is a work of art: no two paintings are ever alike. The dyes are set for colorfastness, the resist is removed, and the scarf is washed to restore the hand, or feel, of the silk. This one feels gorgeous. 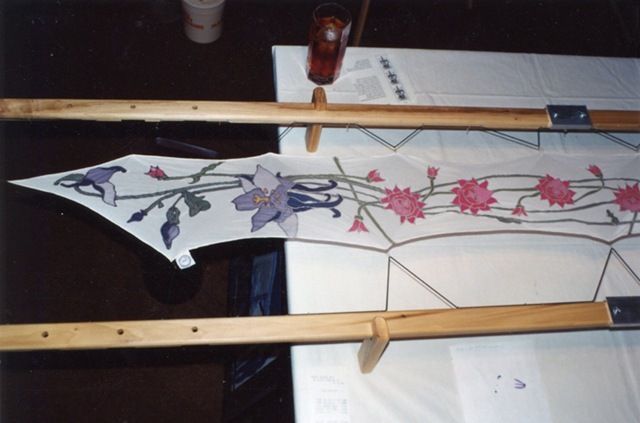 Here’s an example of a stretched piece of silk in process. I use a stretcher frame designed and marketed by Susan Moyer. You may see many more examples of my silk paintings at my shop at Etsy. Entry filed under: All Posts, art and artists, symbols / personal iconography. Tags: Althea Peregrine, AltheaP, ancient art, feminist spirituality, iconography, Janine Maves, scarf, shawl, silk, silk painting, symbols, women. Great posting, so interesting to learn something of what makes another artist tick! Great to learn about where you get your images. It was nice to read the stories behind the images. Very interesting article. I love reading and learning about something so creative. My grandmother worked in the silk industry around th 1920’s. She has a beautiful book on the making of silk. I have to keep it well preserved after so many years, so this was of a great interest to me.